Migraines, sinus infections and cosmetic procedures can leave your face throbbing and your skin tender. 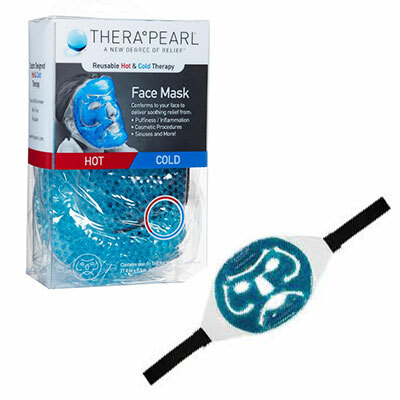 TheraPearl's full-face mask covers it all, so you get instant pain relief from forehead to chin. The oversized round mask has openings for eyes, nose and mouth, and a fully adjustable Velcro strap that holds it comfortably in place. Heat it to open clogged sinuses, chill it to soothe tender skin, or make it part of your facial routine. Chill it in the fridge or freezer for analgesic cold, or pop it in the microwave for penetrating heat. The pack holds its therapeutic temperature for a full 20 minutes so you get fast, effective relief. Conforms to your body to deliver soothing relief from: migraines, sinus infections, cosmetic procedures and more.